International donors have pledged more than $4bn (£2.54bn) in aid to Yemen, which is facing a possible humanitarian catastrophe. Neighbouring Saudi Arabia is providing the bulk of the funds, promising $3.25bn to help the goverment improve infrastructure and security. Aid agencies have warned that Yemen is on the brink of a food crisis. At an international conference on Yemen, the Sanaa government is thought to have asked for some $10bn in help. Yemen has been shaken by pro-democracy protests, communal unrest in the north and an Islamist conflict in the south. Attending the “Friends of Yemen” conference in Riyadh, Saudi Foreign Minister Saud al-Faisal said the funds were aimed at achieving stability in Yemen. “I assert one more time our support to Yemen to back all the phases of the political initiative to help achieve security, stability and prosperity in facing the threats of extremism and terrorism,” he told representatives from Western and Arab Gulf nations at the start of the gathering. He said the money would go towards supporting “development projects”. But when the BBC questioned a senior Saudi official on exactly what the money would be spent on, he said it would support Yemen’s currency, cover the deficit and strengthen the security forces. While the fragile government in Sanaa may welcome the extra funds, the money will not address the urgent humanitarian needs of those facing starvation outside the capital, says the BBC’s Emily Buchanan. In February, the Yemen government reportedly said some $3bn aid pledged by the Friends of Yemen group in 2006 still had not been delivered. On Tuesday, the UK government announced it would be providing aid for at least 250,000 of the most vulnerable in the country – including nutrition support, food aid and the provision of safe water. In a joint warning on Tuesday, a group of seven charities said that 10 million Yemenis – 44% of the population – were currently undernourished, with five million requiring emergency aid. In their warning, the aid agencies – Care, International Medical Corps, Islamic Relief, Merlin, Mercy Corps, Oxfam and Save the Children – say malnutrition rates have doubled in the country since 2009, partly as a result of a surge in food and fuel prices. The problem has been exacerbated by political instability and conflict, with nearly half a million people displaced from their homes by fighting. 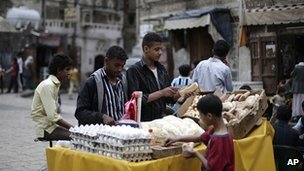 Markets across much of Yemen have food available, but many Yemenis cannot afford to feed their families, the aid groups warned. “Yemeni families are at the brink and have exhausted their ways of coping with this crisis,” Oxfam’s international director, Penny Lawrence, said. According to UN estimates, a third of Yemeni children are malnourished. A UN humanitarian aid appeal for Yemen is facing a $262m (£166m) shortfall in funding contributions. In February, President Ali Abdullah Saleh stepped down in response to months of protests that paralysed Yemen’s political system. Islamist militants have taken advantage of the upheaval to seize parts of the southern province of Abyan, now considered a stronghold of al-Qaeda in the Arabian peninsula (AQAP). In addition, the government is grappling with Shia Houthi rebels in the north of the country.